Wash the duck under cool running water, remove any icky bits that might be inside. If you have the duck liver, gizzards, heart, for god’s sake, don’t throw them out! Reserve these innards and make a lovely sauce, make some crostini, be creative! Cut the tangerine in half and stuff it into the cavity, along with the two peeled cloves of garlic, give them a light crush before putting inside the bird. 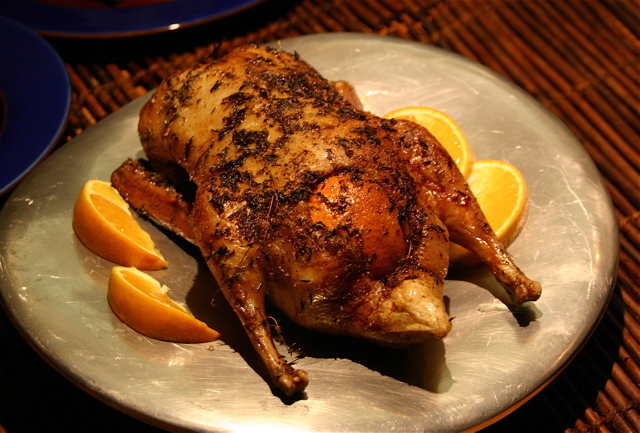 Place the bird in a small roasting pan and generously sprinkle the skin with salt, pepper and thyme. The salt is what is going to make the skin crispy and act as a moisture seal, so be very generous with the salt, rub it in good and plenty. Roast the bird for about 45 minutes, when you tip the bird, the juices should run clear, not bloody. If you would like a little light sauce, warm the tangerine juice and then add a generous shot of Grand Manier, or Cognac or Calvados or similiar strong spirit. Let the mixture come to a boil for a minutes to cook off the alcohol. When you remove the duck from the oven, carefully skim off the fat, and reserve for later. Add the juice/Grand Marnier to the roasting pan and deglaze the pan. Serve the juice in a small dish along side the duck. Now, about that duck fat. It’s damn good. Strain it and put in a sealed container in the fridge or freezer. Fry some potatoes in it. Frizzle leeks in it. Keep it around until you make a batch of duck confit. Saute onions in it. Don’t have a heart attack, literally. Your body understands how to break down duck fat much better than it knows how to break down a McDonald’s french fry. Now, isn’t that good news?